Active Soccer 2 DX is an over-priced, under-produced disappointment. If you're looking for a quality soccer game on the cheap, then buy last year's FIFA. Sports titles have gotten more and more complex as gaming has evolved. In-depth simulations like FIFA rule the land, alienating more casual fans who would like to enjoy the sport without learning a complex control scheme. That’s where Active Soccer 2 DX comes into play. 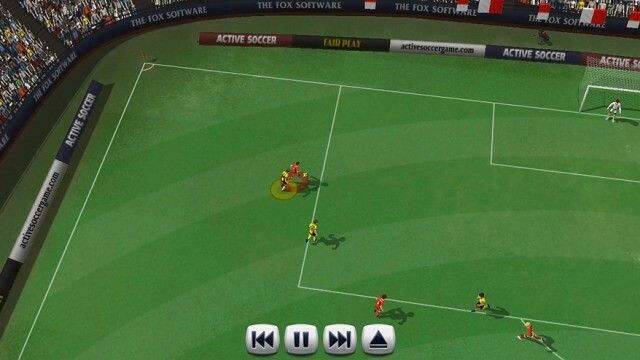 The Fox Software’s soccer game looks to bring the simplicity the genre had in the 90s to modern platforms. It’s a great idea in theory. As someone who still boots up NHL 94 semi-regularly, I definitely get the appeal behind playing a less technical game controls-wise. However, a brilliant idea is nothing if it isn’t executed correctly. And that’s where Active Soccer 2 DX ends up dropping the ball (pun intended). Before we get to what’s so disappointing about the product, let’s at least give it credit where it’s earned it. The core gameplay feels totally fine, although it never manages to exceed modest expectations. Players will use three of the controller’s face buttons to kick, pass and lob the ball. There’s also a sprint mechanic, which is uncomfortably mapped to the Y button, that will need to be utilized if you want to be competitive in matches. Sadly, there’s no customizable controls, so you’re stuck holding the Y button instead of a trigger to burst. It’s pretty ridiculous not to have re-mappable controls in games, and it’s just one of many shortcomings here. While the gameplay is totally passable, the real issue is that in almost every match players will experience some sort of bug. These range from the game just not caring about the rules of soccer and allowing you to walk in a corner kick to player animations that judder more than a poorly animated claymation film. 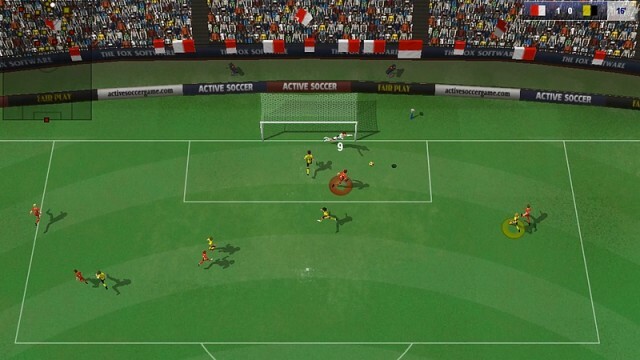 Active Soccer 2 DX makes it clear in just about every match that it wasn’t properly QA tested. Other issues come in the form of the horrendous presentation. It’s difficult to navigate even the simplest of menus, not even due to the clumsy menu design (of which there is plenty), but due to both the D-pad and analog stick being overly sensitive. If you simply tap on the D-pad to select a menu, you’ll likely over shoot your desired target by one and end up on another. It basically becomes a logic puzzle where you’re trying to land on an option that is two spaces away from where you want to go just so you can select the one you want. This lack of polish is unacceptable, and made me think that my controller was broken until I ran into the same issue while using my secondary controller. There are a few different single player modes to check out here. My favorite was the tournament mode where you can create your own totally non-sanctioned World Cup. These give matches some meaning, and you barely have to spend time in menus, which is a big plus. There’s also a career mode where you can attempt to pull off transfers, free agent signings, and squad management if you can figure out the convoluted interface. While games like FIFA make these business transactions simple to the player, it feels more like staring at a spreadsheet here. Graphically, the game looks nice, as the simple art style fits the mood of Active Soccer 2 DX. There are even some nice weather effects such as snow and lightning (pro-tip: don’t play soccer while it’s lightning outside) are present. The Fox Software has also done a very good job of making team outfits matching up with their real life counterparts (at least the more popular teams) despite being an unlicensed product. So, the Tottenham team will have the stripe on their home kit, even if they aren’t really the Hotspur. It’s a nice touch (although kind of hilarious when you consider the legal disclaimer that the game shows declaring any resemblance is coincidental), and it’s a shame the rest of the title didn’t receive as much polish as the graphics did. If there’s any redeeming value here, it’s that Active Soccer 2 DX can be a relatively fun time when being played with others. Since it’s easy to pick up and play, you can even get your friends who aren’t huge gamers to join in on the fun. The lack of online multiplayer, however, kills a lot of the potential value in Active Soccer 2 DX. Having the ability to play with others could’ve made it much more appealing, but it’s simply just not offered here. It’s either local multiplayer or bust, as you won’t want to play the single player very much given how difficult it is to have a compelling career. The real insult though comes in the form of the asking price for the product. Despite the mobile version of the game costing $3.99, the price has been raised almost more than 4 times that amount on consoles. $14.99 is what players are expected to fork over for a sometimes fun, always buggy game. If it was priced near the mobile version then some of the shortcomings could be overlooked by consumers, but players expect more out of a game that is priced the same as Roundabout and other superior digital offerings. 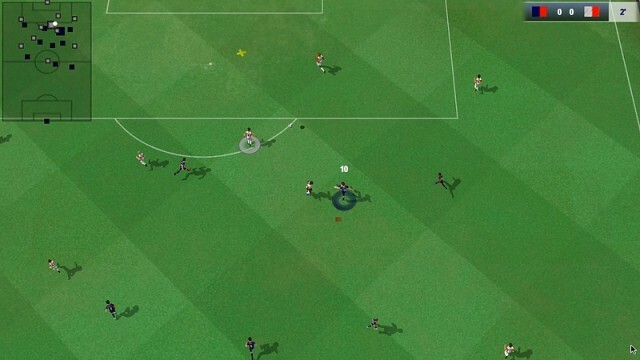 Active Soccer 2 DX has its heart in the right place, but sadly it isn’t up to snuff. It tries to bring back the joy of simplified sports titles, yet doesn’t play better than the games it was inspired by. Throw in an utterly ridiculous $14.99 price point and it loses any sort of recommendation. Hopefully it’ll get sorted out through patches, or in a sequel, but this isn’t the soccer product that fans deserve. This review is based on the Xbox One exclusive, which we were provided with.